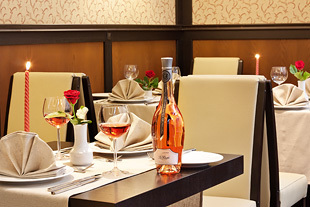 Best Western Plus Bristol Hotel impresses with its wide selection of dishes from the traditional Bulgarian cuisine and European specialties, prepared in the elegant gourmet restaurant with a capacity of 50 seats. Customers with high service-level demands remain pleasantly surprised by the style of the furniture all in classic shades. The wallpapers made of silk with floral elements and the dark-wood paneling represent a natural continuation of the overall design concept of the hotel. The menu contains a variety of snacks, hot drinks and juices, served at a specially created built-in buffet, just next to the delicious and tempting dishes. Lunch and dinner are served with exceptional compliment and attention to our guests in the configuration of two- to four-person tables. The restaurant is suitable for business meetings, corporate occasions and extravagant personal celebrations. During the summer months, the restaurant is connected with a balcony to the courtyard of the hotel, where you can drink a cup of Italian coffee or a cold refreshing drink taking advantage of the cool of the morning or evening hours.